If you enjoy a rollicking laugh-out-loud comedy with elements of farce, you could do no better than come along to see ‘Forget-Me-Knot’ by David Tristram, the next play to be performed by The Apollo Players. Someone who may or may not be Robert Zeinfeld is found wandering through the streets of Leicester in the early hours of the morning. How did he get there? Is he who he appears? How did he get the bruise on his head? Has he really lost his memory? And what secrets are held by Robert’s wife? How much help can she be to Inspector Monroe, who is trying to solve the mystery? And where does Monroe’s own wife fit in? And in fact, is anyone who and what they claim to be? The play, directed by Steve Reading, brings together experienced regulars Drew Adcock, Amy Burns and Helen Reading and introduces Simon Lynch to the Apollo stage. The plot has been described as having ‘more twists and turns than a buckled slinky’, but all will become clear in the end…or will it? We are grateful for sponsorship of this production to The Vectis Sunrise Rotary Club, who meet at 7.30am every Wednesday morning at the Riverside Centre to share ideas, pool skills and raise money for local and international organisations. To find out more, go along or phone Jeremy on 01983 539530. ‘Forget-Me-Knot’ is staged from 11-19 May (not Sunday or Monday) at the Apollo theatre, Pyle Street, Newport; tickets may be obtained via the Apollo’s website. 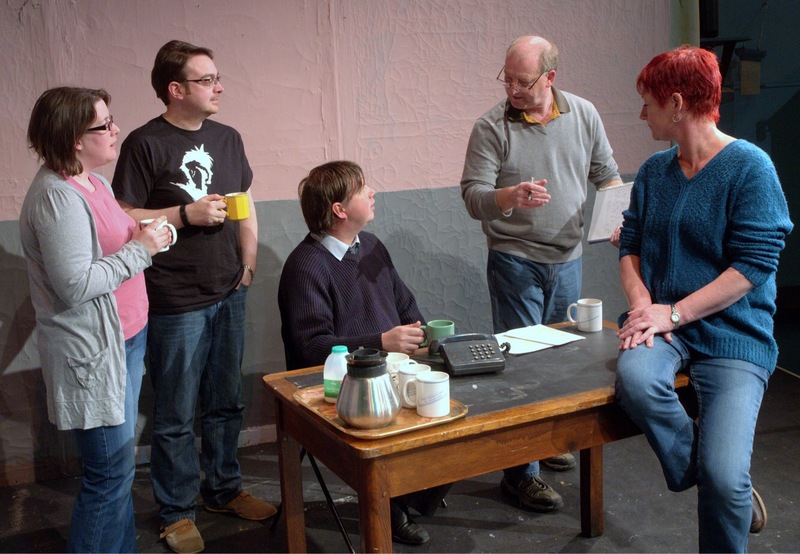 Photo, courtesy of Paul Jennings, shows l-r Amy Burns, Drew Adcock, Simon Lynch, Steve Reading and Helen Reading in rehearsal.